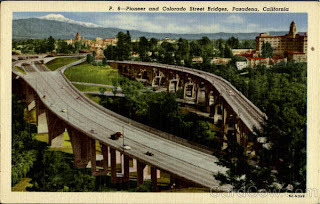 When the Foothill (210) Freeway was planned in the early 1950s, the California Department of Transportation made known its intention to demolish the Colorado Street Bridge. But after much public outcry and appeals from the City of Pasadena and other organizations, Caltrans allowed the bridge to stand and built their own bridge parallel to it. Pasadena Pioneers Bridge is named for the party of settlers led by Dr. T.B. Elliot, a physician who held meetings in his Indianapolis home for people interested in moving to California and settling where the sun would shine year-round. After extensive fact-finding, the party of settlers came by train, then boat, then wagons to what became the Indiana Colony. 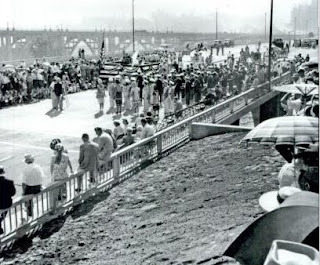 Ground was broken for Pioneers Bridge in 1951. By then, daily traffic on the Colorado Street Bridge was causing stress to that structure to the point where traffic was not allowed during peak hours. It is 1,364 feet long with three spans and is 131 feet tall. More than 41,000 cubic feet of concrete were used on the project, which includes 5.5 million pounds of reinforced steel. Total cost was $6.5 million. At that time it was the largest bridge ever built by the State of California. The dedication ceremony on Oct. 8, 1953, was spectacular. The 2 p.m. event included a parade, entertainment and plenty of speechifying. What made it particularly monumental was the presence of a handful of surviving pioneers and many descendants. The opening signal was given by 95-year-old Jennie Hollingsworth Giddings, whose father had been the first to purchase a lot in the Lake Vineyard area of the colony after owner Benjamin "Don Benito" Wilson parceled off his ranch. Other second-generation Pasadenans in attendance were Don C. Porter, Sidney A. Bristol, Lola Bristol Edmondson, Mrs. P.N. Giddings, Miss Barbara Baker, Mrs. John B. Johnson and William B. Hutton. Additional guests, all introduced by Clarence A. Winder, mayor and chairman of the board of city directors, included California Governor Goodwin J. Knight, members of the U.S. House of Representatives, officials from the California Highway Commission and mayors of neighboring cities. The keynote speech was given by Harrison R. Baker, vice chairman of the California Highway Commission. Upon another historic date, Dec. 13, 1913, the beautiful Colorado Street Bridge was completed and opened to use – stately in the artistry of its design and adequate for the traffic needs of its day – another step forward. Another landmark in the march of Pasadena’s progress, this great, graceful structure became one of the best-known bridge structures in the west, and stands today as a tribute to the energy and foresight of the pioneers of that day. 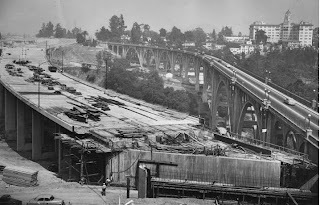 They planned so well that we are now preserving this fine old bridge and incorporating it into the freeway pattern of which the new bridge is a part, for the purpose of carrying a parallel service road across the Arroyo Seco. Today’s ceremony is more than a dedication of a great new structure – it is a dedication in honor of the spirit of the pioneers – particularly that of the 27 founders of Pasadena, but also of the host of other pioneers whose vision and energy have contributed to the building of the community as we know it today. As to the physical feature of the new bridge, it will combine a modern, new, functional motor vehicle traffic facility with distinctive architectural beauty in harmony with the old companion bridge and with the community character of Pasadena. Who dreamed a city that should be fair and went and builded it then. And grubbed and plowed and planted the earth and gave it a smiling face. Who made it a garden from scrub and sage. Let us tell of the Pioneers. And mount upon it a granite hand that shall hold a heart of gold. In the midst of the garden land. To the tides of sea, the city to be, where the groves and gardens are. The dreams of the Pioneers. Foley had been poet laureate of North Dakota before moving to Southern California. He died in 1939 and is buried at Forest Lawn. O, this is one of my favorite posts so far. I agree with AH, this is such an interesting post. I soak up local history, but I never knew it was built as long ago as 1950, and was called the Pioneer Bridge - I always thought that name referred to the Colorado Street Bridge. I'll be more reverential the next time I hike underneath it. I never knew there was so much history behind that bridge too. 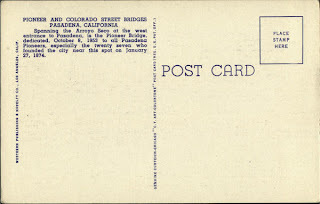 I love the old postcard. It sure looks different. Of course! The angle of the pic was...Ditto de above! The next time I look at what I shall now call Pioneers Bridge, I'll think of it differently because of this post. Thanks for the history.